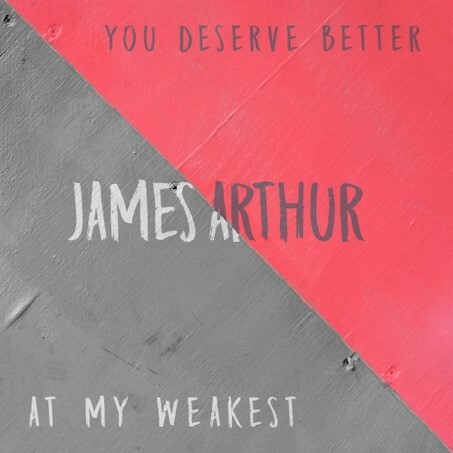 Chart-topping British artist James Arthur releases two brand new songs “You Deserve Better” and “At My Weakest” today via Columbia Records. “You Deserve Better” is an up-tempo future smash, featuring a soulful groove, funk guitars and James’ trademark stunning vocals and harmonies. The track, written by James with superstar songwriters Camille Purcell and TMS, sees James tell a love they are better off without him. Showing another side of James, “At My Weakest” is a beautiful gospel-tinged ballad that is sure to appeal to his ever growing army of fans worldwide. James recently joined forces with hitmaker, producer/DJ Marshmello and influential hip hop titan Juicy J in releasing the emotional track “You Can Cry.” The song continues to break new ground for celebrated mystery artist Marshmello who was equally inspired by Juicy J’s legendary skills and Arthur’s distinct vocal style. The last two years have been remarkable for James. Since being released in September 2016, comeback single “Say You Won’t Let Go” has sold more than 9.6 million copies worldwide and secured nearly 2 billion combined streams. In addition, James’ album Back From The Edge, released in October 2016, went straight to No.1 in the UK charts and has gone multi-Platinum worldwide. Late last year, the charismatic star released his current single “Naked,” which he crafted with noted songwriters Max Martin, Savan Kotecha and John Carlsson. The video for the song features James alongside model/actress Cressida Bonas and has over 90 million views to date. 2017 also saw both a 42-date arena tour with ‪OneRepublic across the USA and a sold out 11-date UK arena tour. Since then James has continued to work on his new album with leading lights such as ‪Ryan Tedder, ‪Justin Tranter and Max Martin.